Forty years earlier, a man committed suicide in a stolen car at this farm at the end of the road. Like a fuse on a firework, his death lit a touchpaper and resonated in unimaginable ways. The darkness was unleashed, something scary and thoroughly incomprehensible to a little boy. And Lettie—magical, comforting, wise beyond her years—promised to protect him, no matter what [x]. Review: This book is childhood. It is so hard to review this book because even a few days after completing it I still can’t fully understand all that I have read. It was so intriguing and well written. You are taken inside the mind of a seven year old. As these magical things begin to happen you accept them for what they are as when I was seven years-old I thought magical things existed. It was nice to feel that sense of nostalgia. If reading this novel and only skimming the surface you will not see what others are raving about. If you didn’t fully digest what was being read you’d just think it was your typical children’s magical horror story. But if you look under the surface there are so many aspects interwoven between that might be hard for a child to fathom (not having a lot of money, mom having to work, father having an affair with the nanny, abuse). That leaves you with the question… Was the magic that happened in this story real? Or was it how the seven year old was coping with what was going on? 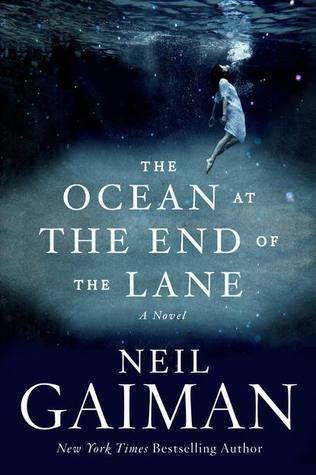 This was my second Neil Gaiman novel, the other being The Graveyard Book, I think my next book that I will be reading from him will be less child-like. I want to see the range of his writing. I would definitely give this a read as it’s nice to be transported somewhere else even if it’s just for 181 pages.